Imari ware was largely produced in the porcelain kilns around Arita and exported to other areas and overseas through the port of Imari, hence the general term for the porcelain produced in northern Kyushu. In order to distinguish those produced during the Edo period (1615-1868) from the modern/contemporary Imari ware, the former is also called 'old Imari ware (ko-Imari)'. Production of porcelain in Japan began in the 17th century after the discovery around 1610 of the porcelain clay in Arita by some of the Korean potters brought out by the feudal lord of the region. The early designs were copies of Chinese designs in underglaze blue, but soon the overglaze enamel technique was developed around the middle of the century by a Japanese potter who learned it from the Chinese through a Chinese merchant in Nagasaki. 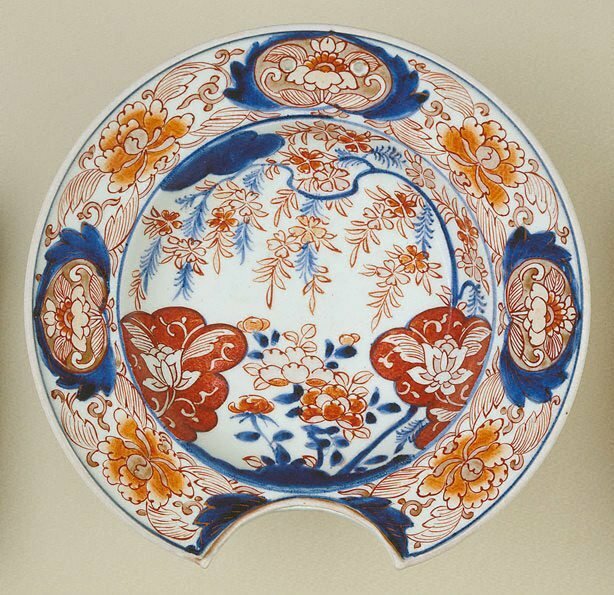 In 1659, the Dutch East India Company placed their first orders for porcelain from Japan. This was a result of the fall of the Ming dynasty (1644) and the subsequent establishment of the Qing dynasty, which interrupted the supply of export ceramics from China. From this time until around 1700, the increasing orders stimulated the production and development of Arita porcelain. The use of gold began during the Genroku period (1688-1704). The shaving dish is one of the shapes specifically designed for export ceramics, and is not uncommon outside Japan. This dish is an excellent example of the type: its design is pleasantly relaxed and fresh, while in later pieces the design tends to become stiff. While the gold is mostly worn off from use, good patina has developed in its place.